My mom is back with a recipe for a delicious and easy sweet treat. 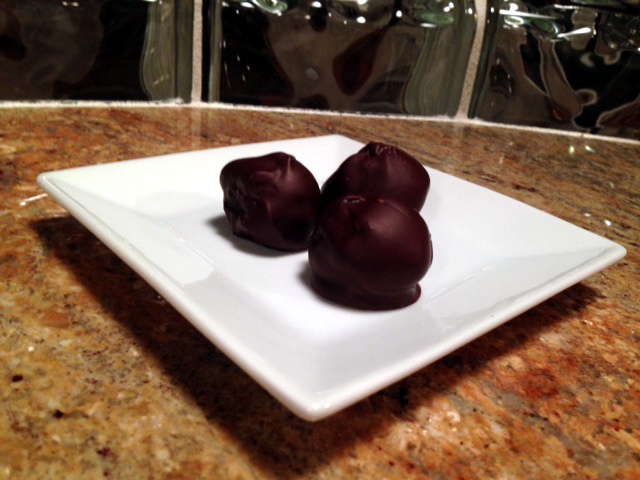 These delicious gluten free cookie balls have become a family favorite. Grandma T’s version uses some specific brand ingredients that are tough to find in the United Kingdom. Following her American recipe, I’ve written the recipe for the gluten free cookie balls I made with UK brands. ^Grandma T says that you only need the wafers when using extra dark chocolate because it would be too thick otherwise. If you are using regular dark or milk chocolate chips, omit the wafers. 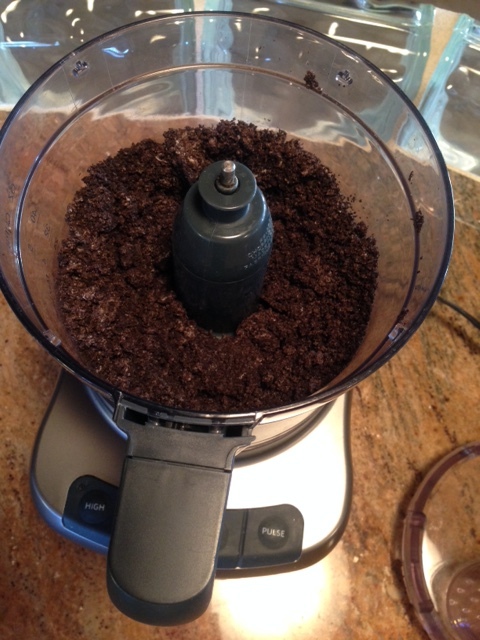 In food processor, finely crush cookies until no chunks remain. In medium mixing bowl, combine cookie crumbs and cream cheese by using a fork to smash, smear and stir the mixture until the dough is well-blended. Use your hands to roll bite-size pieces of dough into balls. Place balls on a cookie sheet lined with wax paper. Place the sheet of cookie balls in the freezer for 10 minutes. Melt about half the chocolate chips and half the wafers in a microwave safe container (I use a glass measuring cup). You want the chocolate JUST melted – try not to overheat! 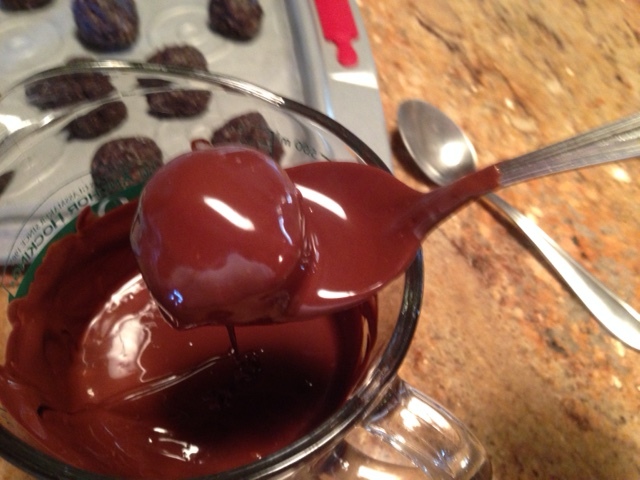 Using a spoon, dip each cookie ball in the melted chocolate, covering completely, and return to prepared cookie sheet. Melt more chocolate as need to coat all balls. 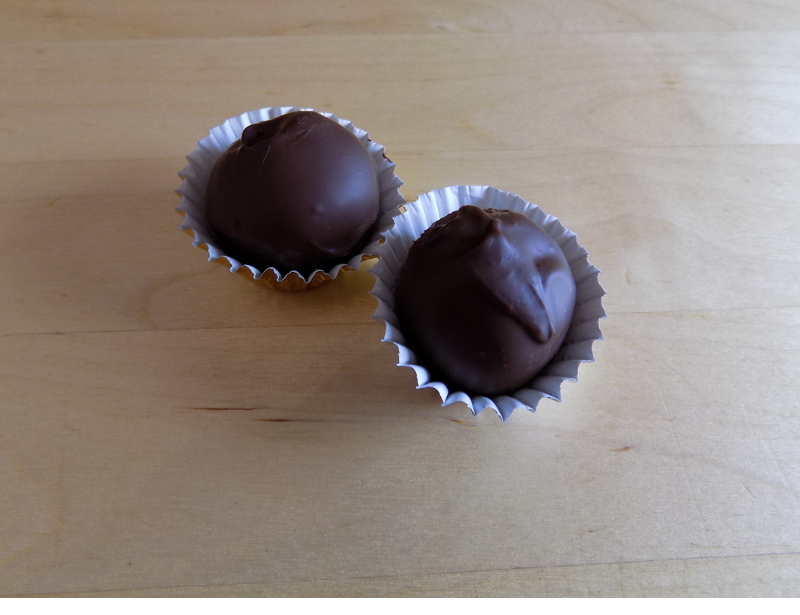 When you finish dipping all the balls, place sheet of cookie balls in the refrigerator until chocolate is cool and set. These freeze well, and the center stays soft, even when frozen, so they can be eaten straight from the freezer for a warm weather treat. Dunk in chocolate to fully coat. There is always chocolate left in the measuring cup after dipping the cookies. I toss a handful of pecans in the cup and stir, then drop spoonfuls of coated nuts on a paper plate and chill. You can use any nut you choose or get creative! My UK version came out pretty nicely! I took a bunch to a friend’s office yesterday and they were a big hit, even with the gluten eaters 🙂 On behalf of my mom, thanks!